To understand 5 Yellow is to understand 9 Stars. Saying, this year’s news events predictions through 9 Star Ki will be a bit different from what you may have been used to see from us. The year 2013 is a 5 Earth year, but if 5 Yellow is not one of Eight Trigrams and if it has not a specific direction, then what is 5 Yellow? Well, thing is, there could be hardly any all-embracing definition, but whatever 5 Yellow bodes, it would be easily done injustice in the field of Flying Star Feng Shui and even 9 Star Ki. It is fair to say that no dynamic would be equally as misunderstood. So, before we step into at least a bit of forecasting for the year, we need to surround the notion of 5 Yellow, which such trying to explain the concept can be but anyone’s feeble attempt as no-one seems to be able to give a definite explanation. To see whatever it bodes, would first depend on one’s at all ability to yet undo whatever it is that one might have perhaps come across to concern of Star 5 thus far. Just already a slight web search, will give you one after the other ‘accident’, ‘disaster’, ‘death’. Not just that, some in the category ‘knows things’ and while pointing to no more than for example monthly Star 5 – in an attempt then also to have you really dread it and stir up your Heart beat per minute -, even thought it necessary to say definite disaster, or double disaster. Thing is, if you are interested in divination, then in particularly 9 Stars – then notably 5 Yellow -, while you read along this type of connotation, there is no doubt in my mind that Luoshu will close off on you like an Oyster. See, you can read 9 Stars and Luoshu as a novel, but you must come passed Table of Contents and Foreword. Star 5 – let’s continue to call it that – has no Trigram, but it is still a Star within the 1-9 range. That said, 5 Yellow is also a Principle, so that it is above and beyond 9 Stars and Trigrams. Now that 5 Yellow doesn’t adopt a Trigram, wasn’t same as in saying that Star 5 has no attributes, but just as not we would take any of the 9 Stars for just its ‘malign’ properties, 5 Yellow becomes no exception to that. As 5 Yellow in 9 Ki can be a tunnel, it would not be a ‘good’ tunnel or a ‘bad’ tunnel, which is no different where Star 5 may depict a compound, a market square, a boulder. While this image stays close to Qian Heaven 乾 Trigram ☰, it would closely resemble the Chinese character for king (Wang 王), where it connects the upper line for Tian Heaven, the middle line for Ren Man, the bottom line for Di Earth, or time-action-space. Saying, whatever else it would bode, 5 Yellow is the governing principle in everything pertaining to Heliocentrism, Egocentrism, Geocentrism. As 5 Yellow sets the stage, Star 1 comes as a proportionate swirl out from Star 5, Star 2 equally as another one of its swirls out, and so on. Back to square one, prerequisite in our clearly noting what 5 Yellow bodes is, just as would be true for all Stars, it may cast either its beneficial or unfavorable properties, so that, importantly, just upon so much as only noting Star 5, was not enough to deem it, whatever, favorable or unfavorable. It’s favorable portents come equally unmitigated, as Star 5 can take human kind to great performance. 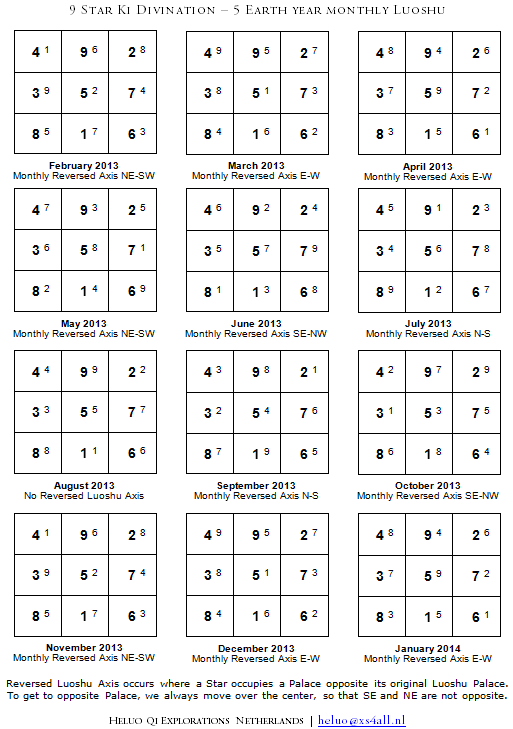 If we are used to employing Star 5 for purpose of Flying Star Feng Shui, while then we deemed the occurrence of any Mountain Dragon 5 or Water Dragon 5 in our Flying Star chart unfavorable – because Star 5 is untimely in Feng Shui Period 8 -, then not able to see that on the other hand, from 9 Star Ki derived annual- and monthly Stars are always timely, then hardly would we be able to further practice 9 Ki Divination to concern of personal life progression or news events. This is because we need to see exactly why it was that 9 Stars as employed for purpose of Flying Star Feng Shui would be deemed either timely or untimely. It is for reason only, of course, that Fei Xing Feng Shui resorts under the umbrella of San Yuan Jiu Yun (Three Cycles, 9 Periods), which doctrine divides bulks of 180 years in segments of 20 years each. Naturally, once we derive annual- and monthly Luoshu from 9 Star Ki, there will be no at all any relationship with San Yuan, so 9 Ki Stars are always timely. From this it follows that, we couldn’t just note ‘a’ Star, then say it is beneficial or malign. Just as will be true for all other Stars, 5 Yellow may bode both magnificent and malign events, while not would we adhere to any preference upon just seeing it. Even when we stay with ‘timely’ or ‘untimely’ Stars such as in our employing along San Yuan paradigm, each and every Star may bode both its positive and negative behavior. Star behavior doesn’t rely on the particular Star as such as, conditions for a Star to come into beneficial or unfavorable behavior need to be met and it just so happens that those conditions present differently once our domain is Fei Xing Feng Shui, Nine Star Ki Astrology or 9 Ki Divination for events forecasting, then furthermore pending context. So, without at all anyone could be conclusive about the topic and before slightly looking into certain those news events ‘typical’ for 5 Earth years, let’s acquaint with Wu Huang a bit more. Note that you’d best just see the Star or Trigram, then leave any connotation for what it is. One way of looking at it, philosophically no doubt, is that Wu Huang is just that, it is focus of attention. Once we focus on a specific thing in a specific domain, that thing becomes 5 Yellow. Once within same domain, we shifted our focus of attention, once more, 5 Yellow becomes that. I’ll explain, but let’s say, it is our ‘point zero’ and we can shift to wherever in a certain range our then momentary point zero is. Everything in our cosmos answers to and relies on forces of expansion and contraction. Everything comes under electromagnetism, plus pole, minus pole, pole reversal, while then, 5 Yellow handles – and is – all of that. Star 5 can switch off, it can switch back on. A bit cosmological, but for as long as we keep count of San Cai 三才, or the notion of Heaven Qi (Tian Yuan 天元), Man Qi (Ren Yuan 人元) and Earth Qi (Di Yuan 地元) so that at any time we know precisely from which realm we’d be doing our survey, and if then we place 5 Yellow as a ‘notion’ at our focus of attention, any of the 9 Stars become just a spill out, a ‘flavoring’ of it. For this reason alone, 5 Yellow could not be ‘a’ Trigram, as it is just the core of any given domain – for example, everything in the realm of temperature – that may be at the subject of our studies, then how it branches out into super cold or super hot. See, ultra cold is just a ‘swirl out’ of zero degrees Celcius to one side, which the same will be true for hot, but at the far other end of the spectrum. Going by this view, 5 Yellow gives birth to and assumes all Trigrams, while we say it reaches its maximum absolute value in Star 1 at one side of its spectrum, Star 9 at the far other end of the spectrum, or 5 Yellow manifesting as two magnetic poles, one Water (Kan Gua), the other Fire (Li Gua). Thus, for lack of better wording, 5 Yellow becomes our subject matter, or focus of attention. However, before we can have focus of attention, we need establish domain and platform. Domain can be our Solar system, another time our Geosystem, or our human body. Platform can be our then 9 Stars and Luoshu application system in particular, such as Flying Star Feng Shui, Nine Star Ki Astrology or 9 Ki Divination, each time inviting 9 Stars into different behavior mirrored against different conditions. Please note that we could only reason into ‘what’ 5 Yellow (or any of the 9 Stars) represents, after we’d have established domain, then platform, then context. You need to appreciate what each time 5 Yellow pertains to Heliocentrically (reality as seen from the perspective of our Solar system), Egocentrically (reality as seen from the perspective of humans, or ‘all the Aura inward’) or Geocentrically (reality as seen from the perspective of our planet). Most practitioners would not make such distinction and be thus summing up a wide string of Star attributes or Wuxing properties, otherwise unrelated (by domain), all by same sentence. Again, let’s say we picked platform and it is ‘temperature’. There you’d have our stage, so that now 5 Yellow will have been given podium. If then zero degrees Celcius is our point of departure, it becomes our focus of attention, thereby ‘5 Yellow’ and so we needed the notion of 5 Yellow to be at all able to then say that minus 3 degrees Celcius is colder than minus 2 degrees Celcius. It is because as such, we made 5 Yellow to act as our ‘center’, our focus of attention while we had it reside at point ‘zero’. Now, this particular point ‘zero’ was just where we projected 5 Yellow for the occasion, so that, as then once more we would move 5 Yellow, with that, we shift the center. With ‘temperature’ still our chess board, our podium, point ‘zero’ is relative as it could be transported to anywhere same spectrum to act as our new point ‘zero’. Equally, we could take 5 Yellow – which is gravity not for no reason – to anywhere same spectrum, so that, as we place it at minus 50 degrees Celcius, this then becomes our new ‘point zero’, thereby our newly acquired focus of attention, still 5 Yellow, so that suddenly the earlier minus 3 degrees Celcius becomes pretty hot. As it is the Heaven-Man-Earth permeating factor, you are free to assign 5 Yellow ‘platform’ each time, relative to your topic of study, be that the human body, geophysics, solar physics, language or any in itself enclosed circuit, each time providing 5 Yellow with a new chess board where it may freely move. That’s one take, at least, as 5 Yellow is omnipresent and everything at the same time, i.e. point zero, minus 50 degrees Celcius, or any place else the alphabet, at will. It is also once more why not we could just observe a phenomenon and say it is either Yin or Yang, until we know how 5 Yellow positions to make the comparison. Then, how about 9 Ki news forecasting by the hand of Star 5? It is gravity, so 5 Yellow will pull to the surface what lies innate already. Knowing this much, this may give a first flavor of what news to expect, but we can become more specific. While staying close to your news media, expect major discoveries and scientific breakthrough to concern of existence itself, notably then also to concern of brain research. Then also expect discovery – the surfacing – of new species, including those extinct, the excavation of skeleton of sorts, especially with monthly Star 5 to appear in the 9 Fire Luoshu Palace. Star 5 associates with compounds made of stone or concrete, can be places accessible to the public, such as city squares, railway station, subway (commuter stations). Star 5 can be a boulder. Pretty notable will be major trials, high profile, mediagenic, greater than life, such as you may compare the O.J. Simpson trial. Paramilitary groups and armed factions in the news prominently, including motor gangs. On the up side, 5 Yellow may bode installation of new international law and legislation, treaties and long awaited peace between parties that we would have not believed would ever still occur. On the downside, 5 Yellow may associate with war, military occupation, curfew, coup d’etat, ousting of leadership. Actually, as said, Star 5 may pull out what is innate already, saying, you’d see an armed conflict, then it subdues, only for it to resurface 9 years later. You would have to go back 9, 18, 27 or 36 years, while thinking those parties would have been long at peace now, then gradually matters would have started to ‘sweat’ all over again and it comes to another burst out during 5 Earth months or years. That type of thing, so that, we wouldn’t be needing to become specific about certain those countries or regions from where to expect mayhem, because, if you had been with the media closely enough, just expect the calamity. We may see a lot of war rethorics, so that it wouldn’t be even necessary to point out certain those regions specifically, as you may just keep an eye out for armed conflict to concern of what we’d have all thought had been in the past. Then, should this happen, follow monthly Star 5 to see how the conflict will change geography each time. While at it, then also follow monthly Stars as they appear in the central Luoshu Palace to meet annual Star 5. Saying – and as explained elsewhere on my blog -, the central Luoshu Palace will give you Luoshu Trend. In a 9 Fire month we would expect ‘fire in the streets’, in that we may see compounds, city squares on fire, while 9 Fire also denotes armored vehicles, armored personnel, riot police. Monthly Star 4 denotes missiles, month Star 1 could be ‘water in the streets’, which ‘water’ would extend to blood. Anyway, you will note that, whatever Stars arrive the central Luoshu Palace, their Trigram properties would appear as moving images on your television screen. As said, 5 Yellow may pull to the surface what was already there, saying, conflict would greatly revolve around ego, i.e. ‘my people’, ‘my ethnicity’, ‘my religion’, ‘my culture’. Very territorial, notably vendictive and merciless. If associated with military conflict, notably if Star 5 involved too, Star 1 denotes sea battle or islands (delta) involved, Star 2 bodes infantry (just ground troops) or a mob, Star 3 military police and uniformed personnel, Star 4 artillery, airplanes or missiles, Star 5 tanks, Star 6 explosion, ammunition and armed assault, Star 7 navy ships, Star 8 military compounds and ethnic conflict, Star 9 armored vehicles and riot police. Table further on will briefly show what to expect for the year. At the time of your first breath, your natal Star occupied the central Palace of 5 Earth. The next move would take your Star into the 6 Metal Palace where your Star will remain for a year, then proceeding to the 7 Metal Palace and so on, until your Star once more arrives to the central Palace after a full 9 year cycle was concluded. 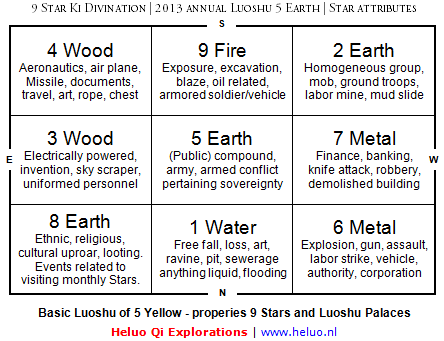 For the 5 Earth year of 2013, your 9 Ki Star resides in its ‘original’ Luoshu Palace, so that, if you are a 3 Wood in Nine Star Ki Astrology, your Star 3 locates in the 3 Wood Luoshu Palace (note how some still errouneously say Nine Star Ki Number, rather than Star, or Magic Square House, rather than Luoshu Palace. House is a term commonly in use for Western astrology, while a Magic Square is to accommodate numbers, but that aside). Following your natural 9 year cycle through Luoshu, we will give you a general description of the dynamics of each Palace in Luoshu, offering basic interpretations of some of your personal do’s and don’ts during certain times. Whether any Palace shows its friendly or unbenevolent face does as such not depend entirely on the Palace. 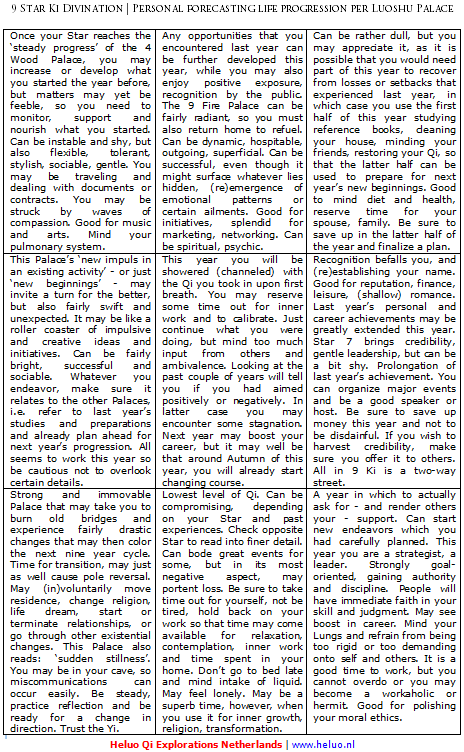 While your Stars proceed through the individual Luoshu Palaces, you will encounter events, people, opportunities and challenges that are related to the properties of those Palaces and the other Stars furthermore encountered by your own, each time perhaps experiencing alterations between highs in one area of your life and certain lows or voids in other areas. It then becomes art – adventure – in itself to learn how to tap into opportunities, while at the same time you may anticipate on and try avoid unfavorable effects. If your Star occupies the central Palace for a year, month or day, see what it says at the central unit of the table further on. Then, when your Star resides in the 6 Metal House, read there. This general description does not consider Wuxing compatibility between Palaces and Stars. In other words, a 9 Fire Star in the 3 Wood Palace will be different from a 6 Metal Star in the 3 Wood Palace. You will be further adapting your reading accordingly. You will follow both first Star of year of birth and your second Star for month of birth through any annual- and monthly Luoshu, but don’t be tempted to gaze at a complex Luoshu if you are not experienced, in which case you perhaps better consider the annual Stars in a Luoshu, which assessment you can then later extend into taking in month Stars. Having to focus in on 9 Stars is different from looking at 18 or 27 Stars all simultaneously. We will concentrate on your first Star and we will limit our observations to the annual Luoshu. In Nine Star Ki Astrology we say ‘Stars govern organs’ and ‘organs produce emotions’, but we will not be looking into personal health outlook or ailments associated with the Palaces. Besides being closely related to your own current physical, mental and spiritual condition, ailments may be related to season, the Palaces your Star will be residing in, the other Stars you will encounter while migrating through Luoshu, if your Star appears on the Reversed Luoshu Axis. Always remember that Luoshu also signifies the human body, with its organs, its meridians, its distinct functions. If you encounter any ailments or mishap, never be tempted to just focus on the Star or Palace and as such blame the Star or Palace for the occurrence, as this would be completely besides the point. Remember that Nine Star Ki is hardly astrology, rather it is a highly sophisticated system pertaining to biological-physiological magnitudes. It is good to gain a working knowledge on all the physical, mental and spiritual manifestations of Stars and Palaces and collect more detail on your search into Traditional Chinese Medicine, Acupuncture, Five Transformations and health, Macrobiotics, even epigenetics. To stay with general terms, if your Star resides in a certain Palace, and stated here fairly popularly, the meridian associated with that Palace will be ignited, releasing your emotions, temperament, activities because the related organ comes into manifestation. The 4 Wood Palace is associated with breathing and the capacity to breath, so Star 4 may invoke ailments that are linked to this, such as bronchitis. Your first 9 Ki Star of birth will reside in its original Luoshu Palace for the 5 Earth year of 2013. Each Luoshu Palace comes with certain properties.